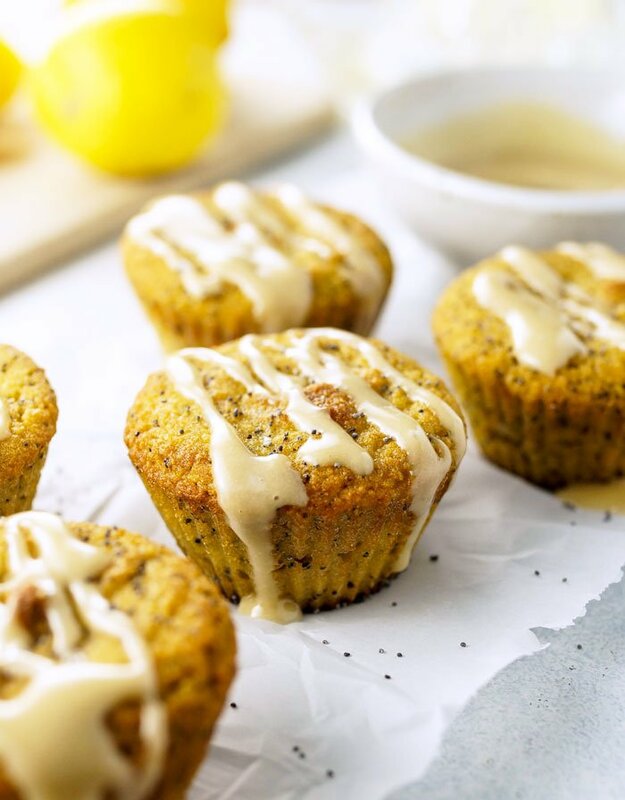 These Coconut Flour Lemon Poppy Seed Muffins have the perfect balance of sweet and tart flavors, and are naturally gluten-free with plenty of protein to leave you feeling satisfied. I love adding freshly squeezed lemon juice to baked goods, as it’s refreshing and loaded with vitamin C and potassium, along with other nutrients like iron and magnesium. Poppy seeds add a mild crunch in this recipe, and also contribute a small dose of calcium, iron, and zinc in each bite. 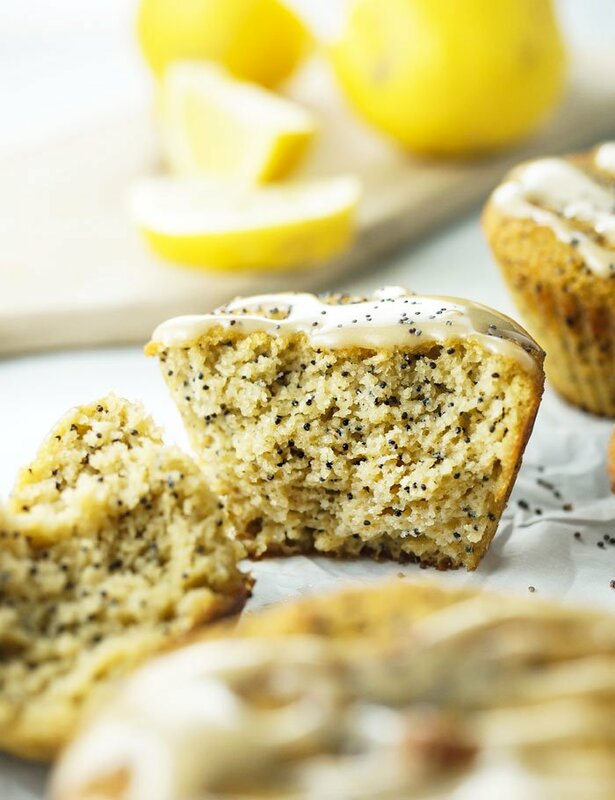 Even my toddler son, who typically doesn’t care for add-ins in his muffins and cookies, loves to bite into these light and fluffy lemon poppy seed muffins! 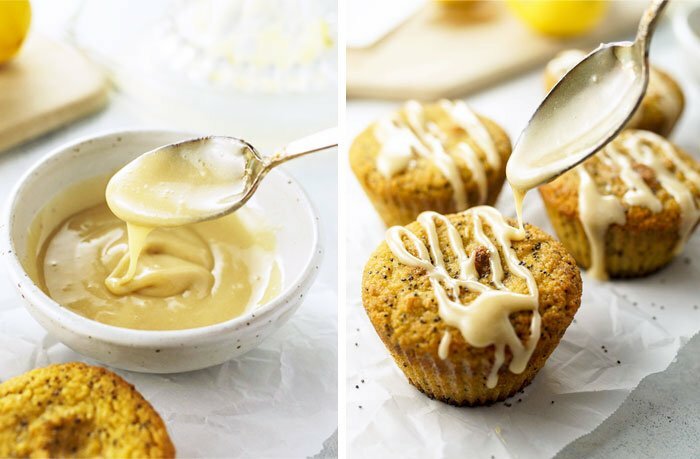 You can serve these fluffy muffins as is, or you can top them with the Creamy Lemon Icing recipe I’ve included for a slightly sweeter and fancier presentation. The icing is not nut-free, so keep that in mind if any of your friends or family members have allergies, but it’s quick to prepare and makes these muffins feel more like a cupcake to serve at a special occasion! This is not the type of icing that will harden, since it doesn’t contain refined powdered sugar, so be sure to add the topping right before serving for best results. 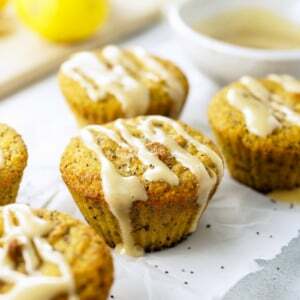 The best Coconut Flour Lemon Poppy Seed Muffins I've ever tasted! They're gluten-free, dairy-free, and Paleo, with a creamy vegan icing. Make sure your maple syrup and eggs are at room temperature. You can place the eggs in a bowl of warm tap water for a few minutes to help warm them up quickly. This will ensure that your muffin batter will be runny, like traditional muffin batter, and will easily mix and pour into the muffin cups. (Otherwise the coconut oil may harden and won't mix evenly into the batter.) In a large bowl, combine the coconut flour, maple syrup, coconut oil, lemon juice and zest, salt, baking soda, eggs, and vanilla, and use a whisk to stir the batter until smooth. The whisk should help break up any clumps, making the batter very smooth. Stir in the poppy seeds, then divide the batter evenly among the 12 baking cups. Bake at 350ºF until the centers are firm to the touch and the edges are lightly golden, about 22 to 25 minutes. Cool completely before topping with the icing below. To prepare the Creamy Lemon Icing, stir together the cashew butter, maple syrup, and lemon juice in a small bowl until smooth. Add water 1 teaspoon at a time, as needed to thin the icing to your liking. Drizzle it over the top of each muffin just before serving. Leftover muffins can be stored in an airtight container in the fridge for up to a week. Flour: Since the muffins are made with coconut flour, I don’t recommend making many modifications to this recipe– coconut flour is SO tricky to work with and cannot be substituted for all-purpose flour, almond flour, or any other flour that I know of. If you’re put-off by the amount of eggs this recipe calls for, you could try substituting a 1/4 cup of applesauce or a flax or chia egg for 1 of the eggs in this recipe, but I wouldn’t stray too far from the number of eggs called for, as they provide the structure of this recipe. Flax and chia eggs rarely work in coconut flour recipes because they don’t rise and firm up in the same manner that chicken eggs do. If you do decide to try working with a vegan egg, make sure you’re prepared for a different results– the centers of the muffins might remain gooey inside. Sweetener: I did try making this recipe with coconut sugar instead of maple syrup, and the results are much darker in color, less sweet, and overall not as pretty. The maple syrup provided a muffin that looks more traditional, as you see pictured in this post. Nut-Free: If you’d like to try a nut-free option for the Creamy Lemon Icing, I’d try using coconut butter instead of the raw cashew butter. Just taste as you go and adjust the flavor and texture as needed. Reader Feedback: Do you have a favorite baked good for Spring? Let me know if you have any healthy makeover requests! I also had the eggy layer at the bottom of the muffin. Although they were still delicious! They will all get eaten anyway, and I will definitely try the recipe again. I see some other people have had the same issue but I don’t see any suggestions as to why it’s doing that. Any thoughts Megan? The only thing I did different (by accident) is I added the poppy seeds in with the rest of the ingredients when I whisked instead of stirring them in after the rest was whisked together. These muffins are great. I had no issues of seperation like some others commented- however i found these to be super sweet. I used 3/4 cup or dark amber maple syrup (same amount as the coconut flour). Has anyone tried cutting the maple syrup amount down? Just tried these yesterday. My friend made them and they were delicious! Made as instructed and they were moist and yummy. Hi! I’ve been doing several recipes from your book since the day I bought it. At first, the vanilla cupcakes where perfect. But then, they didn’t came as the beginning. When cooked, it looks like the eggs remain in the bottom. The same happen with this recipe. They are delicious but, I needed to cut the bottom part of each. Do you know what could be possibly happening? What coconut flour do you use? Hi! I wanted to know if I could use honey instead of maple syrup for this recipe? Sure! It will just have a more pronounced honey flavor and will probably be a little sweeter. I don’t make the glaze, but I make this recipe substituting fresh no pulp orange juice and orange zest for the lemon. I also add chopped pecans. They are amazing! I’ve made this several times. Very tasty and well recieved. Thanks for the explicit directions. You mean before baking them, or after? I’m an avid gluten free baker and former lemon poppy muffin lover. I was really hoping this would satisfy my the craving I’ve had for the past 2 years of my gluten restriction, unfortunately it just didn’t work. They looked wonderful but the eggs settled to the bottom overpowering the lemon taste and giving them a weird wet, eggy texture. Maybe a blender would work better than a whisk, but I probably won’t try these again. They’re soooo good! I simply substituted the poppy seeds for chia seeds since I didn’t gave any and they were a HUGE hit! Will definitely make again! Holy grail of healthy muffin recipes!! This is legitimate excellent tasting. Husband and children had no idea they were eating a healthy coconut flour muffin! Amazing lemon taste! Will make this not only for my fam but for non health but friends. Thank you Megan!!!! Wow – these are delicious and will definitely make a regular appearance on our menu. We have a paleo baker at our farmer’s market that makes these muffins and while hers have no eggs these taste identical. Hers are $3 each, I probably spent less than that on the whole batch. Lessons I learned. 1. don’t use your nutribullet – blender fine but with the chemical reaction of lemon juice and soda and all of those eggs – let’s just say my husband got to sample the batter as did his shirt when he muscled it open. It was not at even the full line (I used my biggest container, but when he let the pressure go it fill to over flowing and made ahuge pop. Lesson number 2: Absolutely use muffin liners. I used my silicone flower muffin pan thinking these would be so pretty – well stuck in the petals is not pretty – very yummy I ate the equivalent of 2 muffins cleaning up after myself. Lesson number 3: 350 not 375 – I misread so mine got done sooner than expected so were a little crispy on edges but even that was oh so good. Lesson 4: you get about 2 TBS of lemon juice from a lemon so I used 3 and I zested all 3 and it was yum. Now I am a hobby chef and I do know how to cook but I was trying to use less pieces of equipment. I do however want to make them in my mini muffin pan for church. I also did half honey half maple syrup, delectable. Thank you for the amazing recipe. Do you have one for dark chocolate muffins with all natural sweeteners and gluten free? Hi, these muffins came out quite dense, which is fine with me but I have a feeling my husband might enjoy a lighter fluffier version. One thing I noticed was that my battery was not smooth. I attribute this to the immediate fizzing and foaming that occurred when I added the baking soda and it hit the lemon juice. Do you think I could try mixing everything together and then adding the baking soda last, to avoid the reaction? Made these and they are fantastic! I skipped the sauce as they were delicious without and didn’t need anymore sweetness. My husband said they taste like the Starbucks lemon loaf. Thanks for the delicious recipe. So good! This is the best gluten free/paleo muffin I’ve had. They were so moist and flavorful.l topped them with your creamy cashew icing to make more of a cupcake and they were so good!! I had the same problem with the maple syrup seeming to pool at the bottom of each muffin. Also, with the silicone baking cups, this recipe made 24 muffins. Does it sound like I did something wrong? The muffins taste great otherwise, just curious! I’ve just made these muffins and not sure what I have done wrong.it appeared to be an awful lot of maple syrup which appeared to separate and lie at bottom of bowl and then the cases. The muffins came out perfect on top but soggy on the bottom. Any tips because they still tasted nice but i would like to perfect the recipe for next time? These are the great. I used egg whites instead of whole eggs, and they were still good. I didn’t make the icing. They were sweet enough for me. This looks divine! I’m aware you’ve advised against editing the recipe but my muffin tin is smaller. So I’m wondering if the quantity of ingredients can be halved at all?! I think you could halve the recipe just fine for a smaller tin. Hope you enjoy them! These are so good! Even the kids and hubby love them! I didnt have poppyseeds so i used chia. I also used honey in place of mapLe syrup. Ill deinitely be making these agAin! Hmm.. I folLOWED THE RECIPE EXACTLY BUT THE MUFFINS FELL. dO YOU THINK MAYBE i OVER-MIXED? Grain-free muffins will often lose their initial dome-shaped tops when they cool, turning into more of a flat muffin top. I think that’s just the nature of not baking with wheat flour. As long as the centers are baked through, they should be good! they didn’t just level off, they were concave, so I’m not sure what happened. They were still delicious so I will give it another attempt. Try cooking them longer. That’s what I have to do with the flourless peanut butter muffins. Have you tried these in a loaf pan; if so, how long to bake? I like that better than muffins as it’s easier to slice and toast. Hi. Would it make a difference if u would replace the eggs with flax or chia n also use xanthum gum n maybe baking powder? Would this combo work ? My guess is no. Usually flax eggs work best in recipes that call for grain-based flours and only call for 1-2 eggs. When you use them with coconut flour, the result is usually very gooey and under-baked in texture. I am dieting because of some health issues. I was craving for some healthy dessert so I made these yesterday, and I love it. I just replaced the poppy seed to chia seeds (since I had them at home) and it was perfect. Thanks so much for your recipe. I made these today and they were a HIT with my husband and two kids. I was afraid they might be to “eggy” for their taste, but none of them noticed at all, and all of them came back begging for another one. I actually don’t have a zester, so I tried to scrape as much zest as I could with a cheese grater, but it was barely an eighth of a teaspoon. I also ran out of maple syrup (was about 1/8 cup short), but added some honey into it to make up for the difference, and even with these unintended modifications, the muffins were excellent! There were fabulous. Moist. Not dense like some gluten free are. I made mini muffins which are the perfect snack size. Follow recipe exactly as is except I substituted hiney for maple syrup. Same amount. Tasted fine and so moist. I tried making these tonight and the egg separated a bit from the rest of the mixture when I baked them. They still taste great but at the bottom of all of the muffins is an eggy layer. I’m thinking it might have happened because the rest of the batter was so light as a result of the reaction of the baking soda and the lemon juice? I didn’t add the ingredients in the order you listed and I also hadn’t preheated my oven (it gets hot VERY quickly and things tend to burn when I do preheat it…), just wondering if either of those could have been the reason or if you have any other ideas? 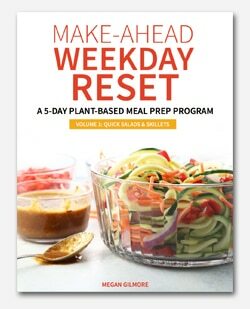 I recently found out I am gluten intolerant and your recipes have been such a great resource, thank you for all that you do! I made them in a silicone muffin tray greased with coconut oil. The bottoms stuck a bit, but they were overall delicious. I loved them. My partner said ‘they remind him of the ones they set out at conferences, but don’t leave you feeling like you ate a brick’. A 5 star recipe. My family loves them. This one will go in the recipe book. Perfect timing! I need to use up my poppyseeds before I move and this recipe is way healthier than the other one I have. I’ll make these next week! Megan, this recipe looks delicious! I own both of your cookbooks and have enjoyed making many of your online recipes as well. Have you tried making this recipe in a cake? If so, how long would you bake it for and what pan size would you use? These are the best paleo muffins I’ve ever had! I normally don’t love the flavor of coconut flour and eggy muffins, but the lemon in these is what stands out. As the batter is very thin, I ended up blending everything together, except the poppyseeds, in my Vitamix, and just stirred the poppyseeds in afterward – no need to warm the eggs or melt the oil. Thanks for such an easy and delicious recipe – it’s a keeper! These look wonderful!! Like Rachel, I’d like to make them egg-free, and am wondering if flax eggs would work, but I’m not sure if I can get away with replacing 6 eggs with flax eggs! I’m afraid my body doesn’t tolerate zero-calorie sweeteners, so I can’t experiment with those. Let us know if you have any success! Looks yummy! I see you don’t reccommend straying from the recipe as coconut flour is tempermental 😉 as a general question do you ever use a date/water paste instead of maple syrup as a fruit sweetener? Trying to avoid all sugars for a bit, except fruit sugars. Thank you :)! Love and appreciate your recipes online and in your cookbooks!! I’m also curious about sweetener replacements. Did you ever try this with the date paste/water combo? I am wanting to replace with honey: I imagine we would both need slightly more liquid to maintain the right amount of moisture in the cake. Has anyone experiementef with honey at all? Agave sugar works great, although I would recommend adding less because it is sweet. Haven’t tried honey though. Megan, this recipe looks delicious! Thanks for making it dairy-free, now all I have to do is figure out how to make it egg free…. I’m thinking some flax eggs could work! I love how you managed to make these higher in protein and lower in sugar. White sugar is the enemy these days, but I don’t want to deprive myself entirely either. Was just reading that in just a few years 1/3 of Americans will be clinically diabetic (not to mention obese). I ate zero white sugar and flour for months so I’d pass my 1 hour glucose test. Fascinating that most woman fail that now. Makes you wonder what changed over the years? Looks delicious! 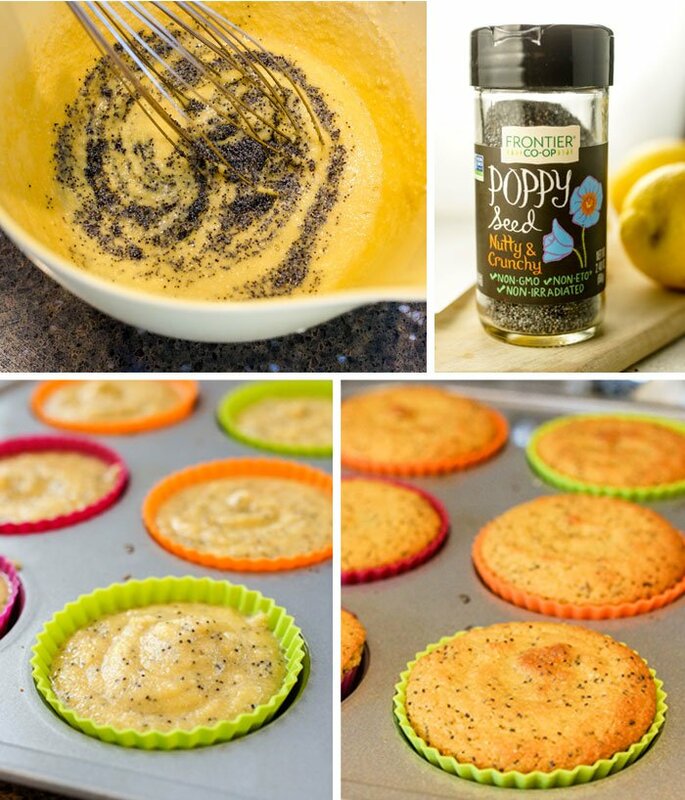 I love lemon poppyseed. Now I can have a healthier version. Thanks for sharing.